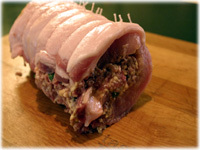 Apart from Chicken and Turkeys, Pork Roasts just seem to be the perfect type of food to fill with tasty stuffing. 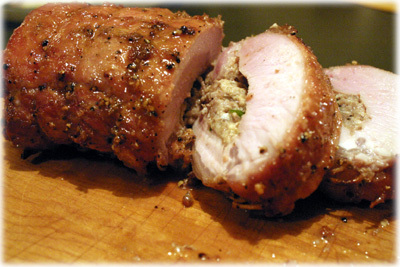 And this boneless pork roast recipe is no exception with it's flavorful filling! The combination of Bratwurst sausage meat with smoked Cheddar cheese, chopped green onions and zesty Dijon mustard work together perfectly with the tender juicy Pork Loin roast. It gets better - you're going to make a brown Sugar, peppercorn, garlic and Dijon marinating paste to cover the roast with and let it sit 4 - 6 hours before cooking. The sugar begins to caramelize with the heat from the grill (or oven) and forms a tasty, sticky crust to seal in the juices. 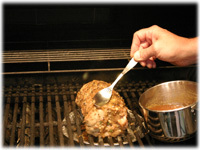 And as the roast cooks you'll brush on a finishing glaze of concentrated Apple juice, liquid Honey and Dijon mustard. This really makes an impressive presentation for formal Sunday Dinners. Note: for best results let the pork roast sit 4 - 6 hours in the marinating paste. 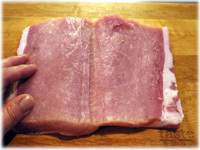 Place the boneless pork roast on a cutting board and with a very sharp knife carefully begin slicing into the center of the roast (sideways) without cutting all the way through to butterfly the pork. 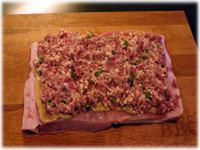 You should now be able to lay open the butterflied pork flat. It's important not to cut the roast all the way through or it will be more difficult to keep the stuffing in. Place a sheet of plastic wrap over the meat and gently pound it with a meat hammer to get an even thickness across the roast. 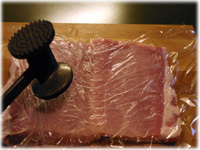 Pork doesn't react as well to pounding like chicken, but do your best. 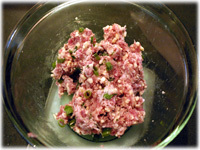 Remove the sausage casings and place the meat in a small glass bowl. 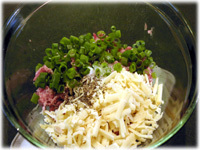 Add the chopped green onions, shredded cheese, salt & pepper and lemon juice to the meat. Stir the mixture well to combine, cover and set aside. 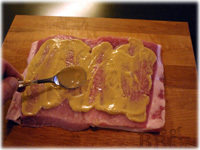 Smear 2 tablespoons Dijon mustard over the surface of the butterflied pork. Spoon the meat mixture over the Dijon to about 1/2" thickness staying back from the edges about an inch. You may end up with extra stuffing mixture depending on the surface area of your roast, you can always save it and make breakfast patties to fry or grill. 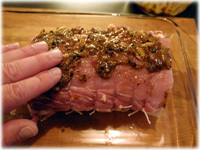 Carefully roll up the roast "jellyroll" style and try to keep the stuffing inside. If any falls out try to poke it back in. 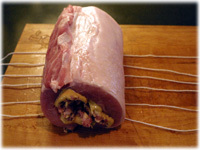 Place 14" lengths of butchers twine under the rolled up roast at about 1" intervals. Tie each length of string securely, cover the roast and set aside. 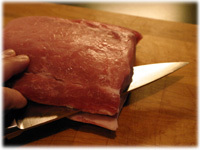 A trick to tying meat like this using a standard knot (and not having to use someone elses finger to keep it tight while tying) is to loop it several time around itself before securing the knot instead of the usual one loop. Place the roast in a shallow glass dish. In a small glass bowl combine the marinating paste ingredients, brown sugar, cracked peppercorns, Dijon and garlic powder and stir well to form a paste. With your hands smear this paste over the surface of the roast. Cover and refrigerate 4 to 6 hours. Preheat the grill (or oven) to 400F and set up for indirect grilling (one side lit, the cooking side unlit). Place a shallow disposable pan under the cooking grates to catch any drippings. In a small sauce pan combine the finishing glaze ingredients, apple juice concentrate, honey and Dijon. Bring to a gentle simmer and let cook for 15 - 20 minutes while the grill heats up. 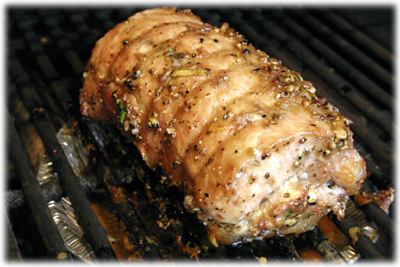 Place the stuffed pork on the BBQ grates over the disposable pan and close the lid. After about 10 - 15 minutes roll the roast over 1/4 turn and base with a little of the glaze. Continue to do this every 10 - 15 minutes until the internal temperature of the roast reaches 145F. Once the roast reaches 145F and has a nice sticky outter crust it's time to remove it from the grill and cover it for about 10 minutes with aluminum foil. Cut the strings and cut the roast into slices as thick as you'd like.